Micro Kickers Soccer League offers new players an opportunity to be introduced to the game of soccer in a fun, engaging and non-threatening environment. 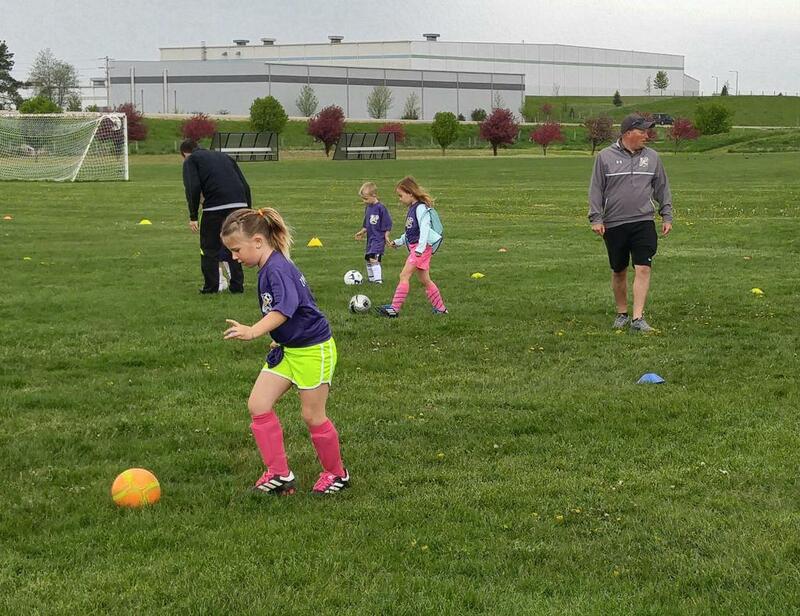 Experienced coaches along with parent volunteer assistance will lead these newest athletes in exciting soccer related activities and games that create a positive first experience with sports as a whole and specifically the game of soccer. What to bring/wear: Size 3 ball, bring a water bottle and wear shin guards/t-shirt. NSC In-house Kickers Soccer League offers the younger players another option to participate in the game of soccer and further develop their soccer skills at an early age. A staff of well-trained, licensed and experienced coaches will implement the foundation of agility and mobility techniques that will carry over into conducting technical foot skills. These trainings are designed to instill self-confidence and a passion for the game. Primary Training Session (Tuesday evenings 5:00 - 6:15pm): Held on a weeknight conducted by NSC staff coaches with the assistance of parent volunteer coaches. Secondary Training Session (**Optional)(Thursday evenings 5:00 - 6:15pm): Parent volunteer coaches from Norski In-house program will meet up together (1) additional weeknight all at the same location as other In-house teams to work together if needed and implement the session from the primary training day or other soccer specific activities. Parent volunteers are encouraged to help at this age to assist the children in social transitions. Game format will include both 4v4 and 3v3 with NO goalies. Q: Can I register my player after the deadline? A: Registration for both Fall & Spring seasons will be open until one week into each season (There will be early and late registration deadlines). Late registrants will NOT be guaranteed placement on a team. Placement on a team will be contingent on a team availability not to exceed maximum team sizes and availability of volunteer coaches. NSC strongly suggests parents of late registrant offer to help coach. Q: Are uniforms included in my player's registration? A: YES, a jersey is included in your fee. If you are a late registration it may take longer to get. Q: Can I sign my child up with a friend or two? A: The only exception to this rule allows up to three players per team to be pre-assigned PROVIDED their parents or guardians volunteer as team coach, assistant coach and team manager and all players fall into the same birth year. If this interests you, please fill in the Additional Information Volunteer Question during registration for each of the players with 1) the names (first, last) of the other players, 2) the names (first, last) of all 2-3 parent/guardian volunteers and 3) the roles each parent/guardian plans to fill. Without this information, NSC will need to verify the request across all 3 players. Contacting the NSC Registrar via email is also recommended. Q: I like to plan ahead! Do you know when my child's practices will be? A: Practices are determined ahead of time by NSC staff for the primary day of training and game days. While the secondary training session is planned out, it is subject to change depending on player and coach availability.